Venice. A romantic town with a rich history dating to about the second century. Venice would rise to power and dominate much of northern Italy, the Adriatic Sea and become the launchpoint of the Crusades. Please forgive these photos which for some reason have become defective and so I decided to scan them in order to preserve them. The defects are obvious in some but should not detract from the images. I will one day edit out the blemishes. 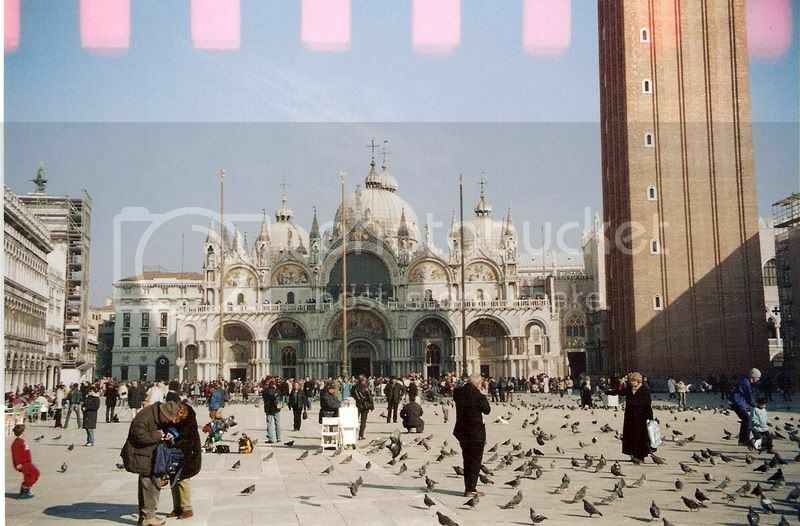 Venice is a truly amazing city with so much to see and photograph. 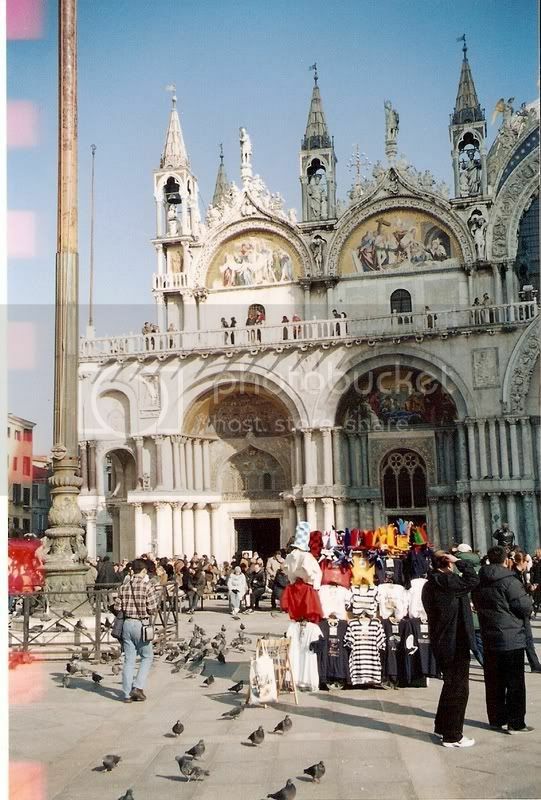 I have literally hundreds of photos including some truly amazing pictures from Carnivale (Marti Gras) with the fantastic costumes parading through the immensely crowded Piazza San Marco. Venice is also the quintessential Italian tourist trap with thousands upon thousands of tourists from every part of the globe crodwding into too narrow streets buying overpriced merchandise, generally poor quality food (unless you leave the traditional tourist areas) and finding practically no public restroom facilities. I was there so many times (mainly to show my visiting friends and their wives) I could conduct guided tours, though I much preferred other less travelled villages and historical treasures off the beaten path. I have decided to to post just a few pictures of some of the common sites. 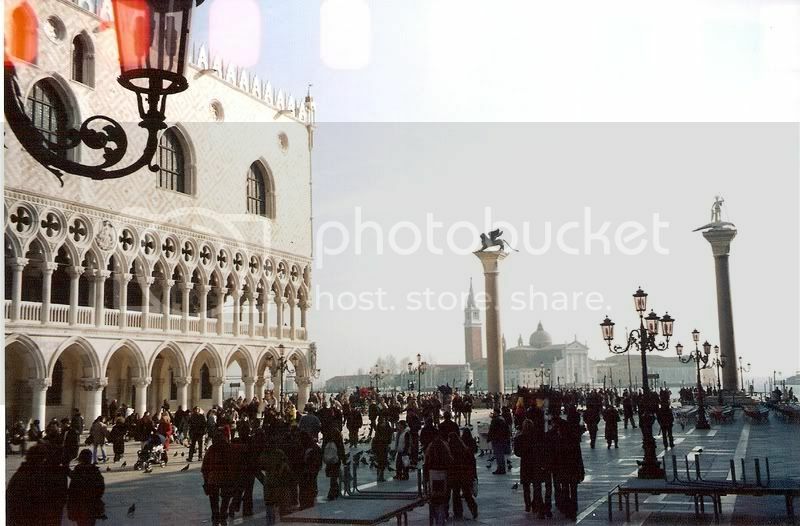 I returned to Venice about five years ago and found the great restoration projects that had begun in San Marco Square were finally complete and city had a fresh, newer look. I hope the defects in some of these photos do not distract too much. One can enter Venice by car (kinda) but you must park in one of the crowded parking garages (often prowled by thieves looking for merchandise in vehicles) or can enter by boat or the train. There is no driving in the city. All traffic is either watercraft or foot traffic. (There are a few small, three-wheeled vehicles used to tug trailers or other such utility. 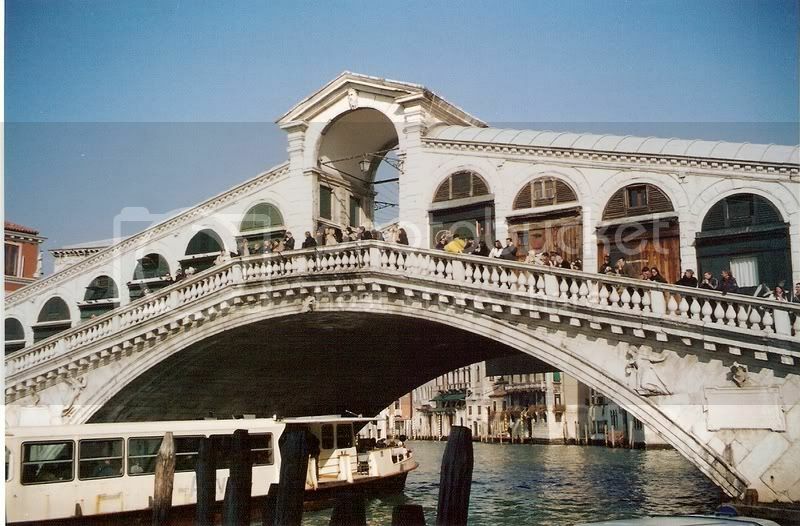 Ponte Rialto passes over the La Canale Grande (the Grand Canal) and is lined on both sides by merchant shops. It is very crowded as it is not all that wide and it is a famous landmark where people take pictures, buy junk - er - souvenirs, and basically absorb the uniqueness of it all. Up and down both sides of the Grand Canal are many outdoor cafes. It is worth spending some time in the area, have an espresso or cool vino bianco and take it in. Those pictures look fine. You are inspiring me to scan my photos from Pompeii. Dominated by beautiful, St. Mark's Cathedral. The Apostle Mark is said to be entombed below the Altar. I don't recall that one can visit the tomb, but in many Italian Cathedrals and Duomos, it is possible to enter the catacombs and tombs walk among the bones of the faithful who are mainly former priests and VIPs from bygone eras. Adjacent to San Marco cathedral is the Loggia of the Grand Duchy of Venice (basically it was once a large government building which today houses a museum and yet more merchant shops). Continuing past the Loggia, is the harbor of the Grand Canal overlooking San Giorgio Island in the distance. 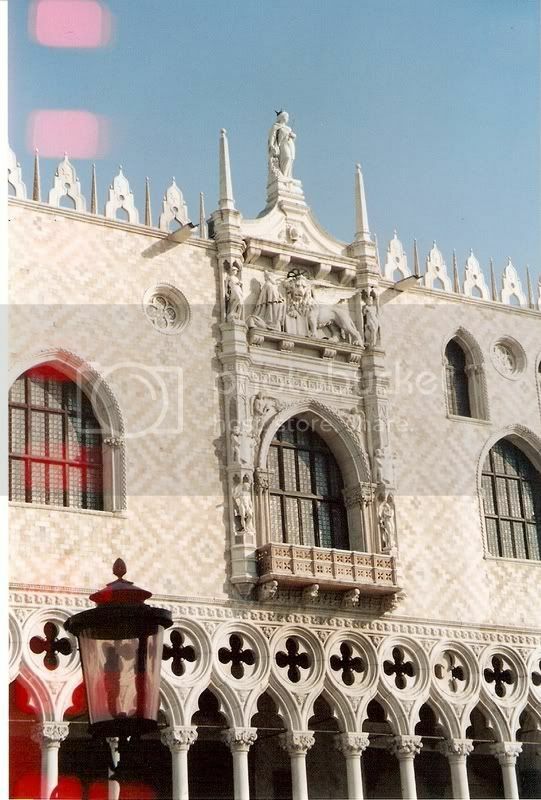 The columns at the entrance to san Marco have the Lion of Venice on one and St. George, slaying the dragon on the other. Lines of gondola await you where for a mere 100 euro per hour you can enjoy a nice romantic trip around the city. Serenades are extra. 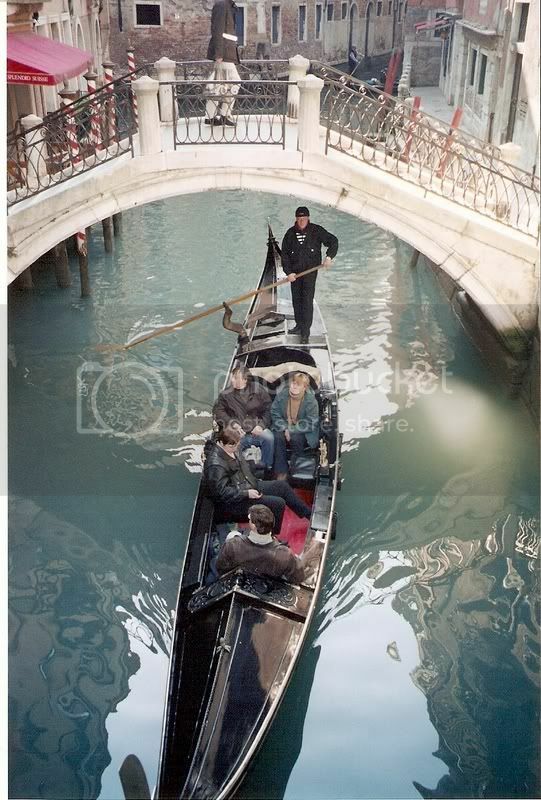 I recall asking one gondolier for the price and I shook my head and walked away. A few minutes later another ran up to me and offered cheaper followed by a third who discounted even more. I guess they were having a slow day. I almost forgot - one last picture. 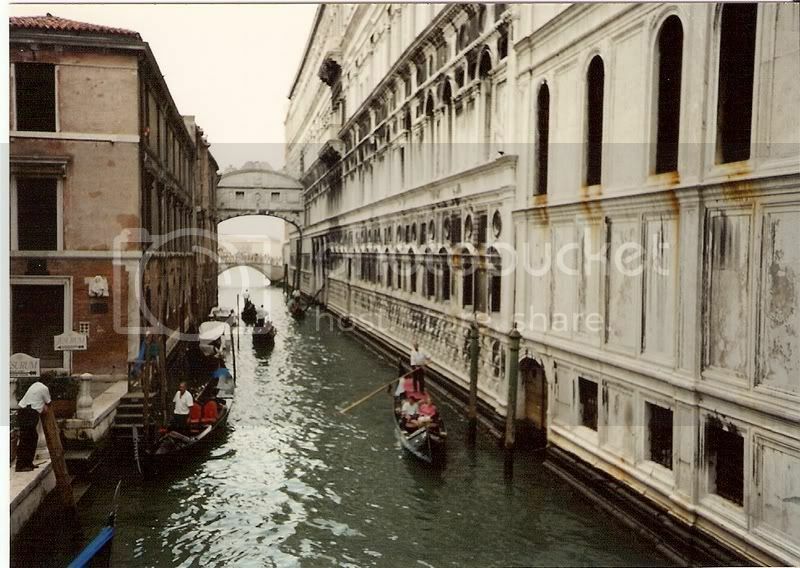 This is the Bridge of Sighs which arches over a canal from the backside of the Loggia to the Prison building.